If there is valid criticism, take heed of it. Think about it and perhaps use it to better your style of writing. If the review is a rant by an apparent lunatic (or loonie, for short), spam for another book, or an attack by a detractor, identify it as such and confine said review to where it belongs: Oblivion. Forget it exists. Insanity breeds insanity, and being a writer, you don’t need more madness than what you’ve already got between your ears. You’re dying… or already dead. A beautifully expressed piece about recapturing lost dreams. One of the feature stories from our fantasy anthology, Dragons and Dreams, starring… me, and a cast of WPaD writers! Let’s face it…the guy was old; old and basically a wreck. He was still 6’6”, but he had ballooned up to 280 pounds…most of it belly. He walked with a cane, had hearing aids in both ears, thick lenses on both eyes, totally white hair, a VERY weak bladder, and, like a lot of old people, he farted a lot. He was arthritic; he was diabetic. And the old short term memory was pretty much shot. BUT…he had a superpower; a superpower that very few people knew about. One of the short stories featured in our romance anthology, Passion’s Prisms. The wind-whipped branches swooshed along the roof, gathering the snow into piles and dumping it to the ground, where it landed with soft plops in the deep snow and loud whumps on the wind-swept sidewalk. Elsewhere, where the roof had been swept clean, the branches clackety-clacked along the roof tiles. Inside the house was complete darkness and silence, except in the living room, where a fire in the fireplace crackled and popped. One of the wonderful short stories featured in our fantasy anthology, Dragons and Dreams. The pages were filled with images that reminded me of death. Unhealthy thin girls, painted up, looking without expression at the camera. They were all underweight to the point of being uncomfortable to look at. Not just thin but skeletal thin. Their faces showed no expression. Their eyes were dead. Expensive clothing hung off of loose and unflattering. In one image a young woman wore a lace bra filled with obvious artificial breasts, her own had been starved off of her body. Each month I discount a different ebook to 99 cents. April’s feature is The Feeder. It’s violent, bloody and intense, with an unpredictable twist regarding the main character’s identity. Grief and vengeance transform a law-abiding citizen into a serial killer. Is it possible to return to a ‘normal’ life after committing acts most unspeakable? A killer stalks the streets of Los Angeles. Victims of the butcher known as ‘The Feeder’ are mutilated while still alive, with severed body parts inserted in their mouths. When Camille places a drunken birthday phone call to her twin, Sammie becomes worried about her safety and flies to Los Angeles to bring her home. After finding the aspiring actress-turned-prostitute slaughtered in a hotel room, grief-stricken Sammie steps into the role of copycat killer. Suspecting that the killer is Camille’s abusive boyfriend, Sammie embarks on a bloody quest for revenge, copying the modus operandi of a brutal serial killer known as The Feeder. Walking the streets disguised as Camille, Sammie resolves to lure the real Feeder out of hiding. Sammie seeks out drug dealers, pimps, rapists – all men who caused harm to Camille. The men are found disemboweled, force-fed their own genitalia and carved up like human Picassos. The bloodbath will not end until Camille’s murder has been avenged. If you are offended by obscene language, graphic violence and scenes of mutilation, then this is NOT the book for you! Read at your own discretion. 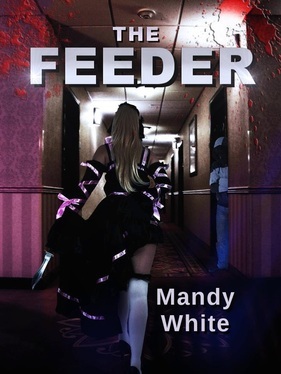 The Feeder is available in ebook and paperback from most online retailers. A sequel for this novel is currently in progress. Look for Fed Up later this year!